If you decide to leave the buzz and noise of Almaty, a major financial and economic center of modern Kazakhstan, the first idea that would come to your mind should definitely be going to the Medeo Skating Rink. Because Almaty is located right at the foothills of the Zailiiski Alatau Mountain Ridge, such an exit to the mountains will not take much time. From the city center, it is about 25 min to reach the Medeo by car. Connect with our travel agency «Visit Almaty» to request a tour including this great attraction. The sports facility is huge. Its construction started in 1949, just four years after the Great War ended. But even before that, the Soviet Government ordered to build a small resort to rehabilitate patients in the mountain zone. See collection of tours around Kazakhstan (https://abasayyoh.com/pages/20 to plan and organize a pleasant and memorable trip in this Central Asian country. 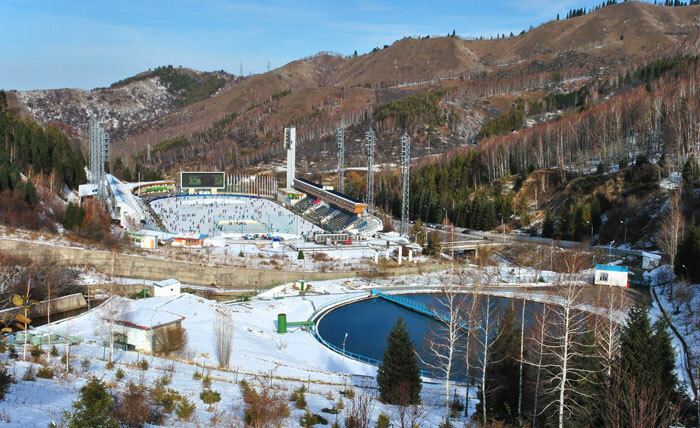 The Medeo Rink is called the "Plant of Records" and it has seen over 200 world records over the time since 1951 when the first competitions took place here. It is located 1,691 meters above the sea level and represents the largest and highest skating rink in the world, over 10,000 square meters of ice. The water for making this ice is taken from mountain springs and a lake uphill, fenced behind a huge Dam which protects the rink and the city itself from mud flows.